We’re pumped to bring you the completely revamped reports feature. Crelate is all about flexibility, working how you want to. That’s why our old reports section got a serious overhaul. Now everything about reports is customizable – customizable dashboards, customizable filtering, customizable charts, multi-paged customizable reports. IMPROVED – Expanded Filtering – We’ve expanded all the filtering options for our reports. Many of the advanced filtering you’re used to using in search are now available in reports as well. Pairing this with saved filters unlocks a tremendous amount of flexibility with your reports. 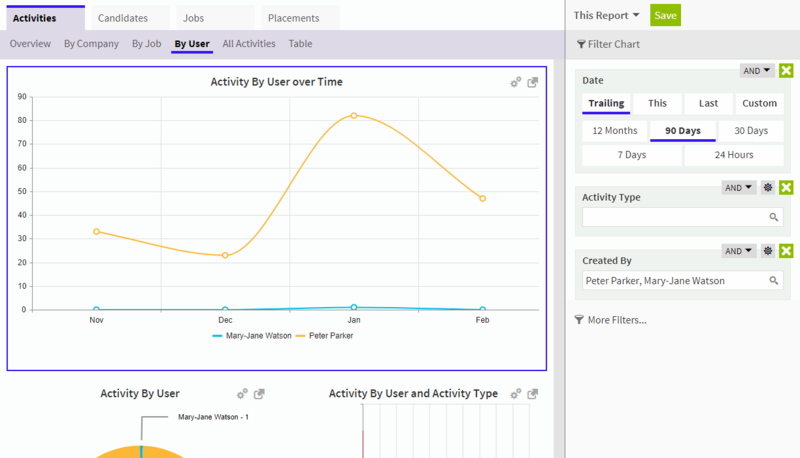 NEW – Save Chart Filters – You are now able to save customized filters for quick access to your most common reports. This can be a huge time saver. 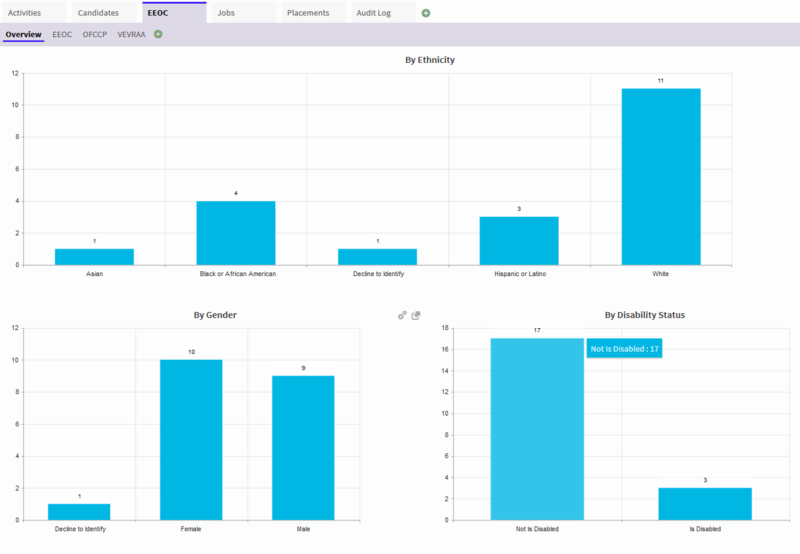 NEWBUSINESS – Customizable Charts – In addition to improved filtering capabilities, Business tier and higher customers are now able to create custom reports and report dashboards, save them, and filter them how you’d like. You’re able to take complete ownership of your dashboard now and see your data exactly how you want to see it. NEWBUSINESS – Chart Creation – In addition to the myriad ways you can customize each chart, Business users can create entirely new charts. If the report out of the box doesn’t work for you, explore all facets of our available charts to create exactly what you need. You own the data, now you own how it looks too. NEWBUSINESS – Recruiting Analytics – Business customers have access to even greater analytic capabilities with our recruiting analytics. Deep dive into your data with Sales Pipeline reports, Time To Fill reports and Conversion Ratio reports. Activity templates are a powerful way to further customize Crelate to your workflow. Just like you can define custom forms and attach them to jobs, you are now able to create custom Activity Templates and attach to them to your activities! You want to ask a set of predefined questions every time you conduct a phone screen? Activity template. You have a debriefing process for every candidate after you successfully place them? Activity template. We’re very excited to see what you do with them. Note: We’ve changed how we use Questions in this upcoming release to make them easier to use. In the past, we had the concept of “Shared Questions”. These questions were available to use on any form and questions created for a specific form were only for that form. With this release, we’ve made all questions, in effect, “shared” so that they are available on any form. We believe that in the long run, this will be easier to manage your questions and help prevent duplication of the same questions. We’ve also replaced Shared Sections with Tags. You can now tag questions with any number of tags and then add questions to a form in bulk by tag! Existing Shared Sections will be converted to tags upon release! NEW – Create Activity Templates – Easily create forms for different activity types. They’re built on the same form editor you love – create sections, questions, add questions by tags, and adjust settings for each question. These activity templates can be associated with any number of activity types. NEW – Easily Add Activity Templates – Attach activity templates to as many activities as you’d like. Simply click on an activity type that has an activity template associated with it and click the add activity template button as shown below and the activity template is added to the activity. Use them to guide users to get the best information in an organized and structured way. NEW – Automatic PDF Generation – Saved forms will be listed right alongside other candidate documents so you never lose their information. These are generated on demand, so they will always have the latest information. If you update the information on an activity, the PDF will reflect that change automatically. What’s more, you can edit, download, or email the completed activity form PDF. NEW – Question Tags – Individual questions can be tagged with custom tags. In the activity template creator, you’re able to add questions by tag to quickly fill out new templates and extend already existing ones. NEW – Detailed Usage – Each activity template provides detailed usage of the template so you can see at a glance how many times the template has been filled out and what activity it is associated with. To help customers comply with Federal requirements, we’ve added the ability perform pre-offer surveys and track EEO, OFCCP and VEVRAA information. We’ve added the ability to provide EEO, VEVRAA and OFCCP questionnaires on your candidate applications, a new EEO user role, and the ability to create EEOC reports. These features, along with your companies federal compliance plan, save time in the reporting and compliance process. NEW – EEOC User Role – The EEO User is a new type of custom user role with a couple of special properties. At its core, an EEO user role is a Read-Only role; They are able to read almost all data associated with Jobs, Contacts, and Companies except for notes and tasks. They are not able to create, update, or delete any data in your organization. However, EEO users along with Admins have special access to EEO data where they can create, update, and delete EEO data and EEO reports. Users can be given an EEO user role in addition to their normal roles which will allow them to function as they normally do and have complete access to EEO data. NEW – View EEOC Reports – Admins and EEO Users are able to access and create EEOC and OFCCP reports. NEW – Job Portal Questionnaire – You now have the ability to add optional EEOC and OFCCP questionnaires at the end of your applications, these are special forms that are not customizable. Candidates can fill out this questionnaire if they choose and the data is only accessible by Admins and EEO Users. 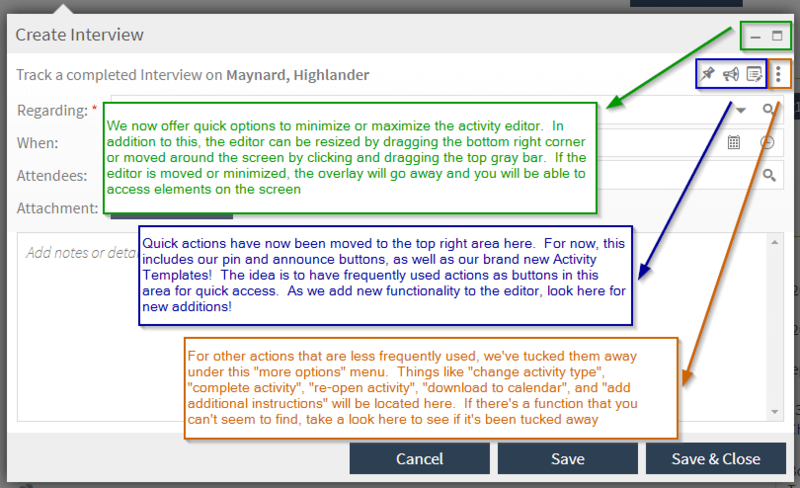 IMPROVED – Activity Editor – We’ve revamped our Activity Editor and made the create and edit experiences the same. We hope that this will make the experience of adding or editing an activity more intuitive. We’ve also consolidated a lot of extra functionality to the upper right into a small toolbar. As we add more functionality to the activity, be sure to look there for new additions! Finally consolidating the activity has allowed us to take advantage of our dialog framework meaning you can now resize, minimize, and drag the activity editor around the screen! NEW – Document Type Questions – We’ve added a new question type to custom application forms: Documents! You may now ask candidates to upload additional documents to the application – ask for a resume, a certificate, credentials, and more. These uploaded documents will appear in the candidate document area. IMPROVED – Application Improvements – Applications can now be sent via email like the new activity forms as PDF attachments or downloaded as PDF documents. IMPROVED – Merge Activities – When merging entities, the activity that is created will now also include who initiated the merge. IMPROVED – Weekly Job Emails – We improved the speed and reliability of our Weekly Job Emails so that every who is signed up to get them should now receive them. 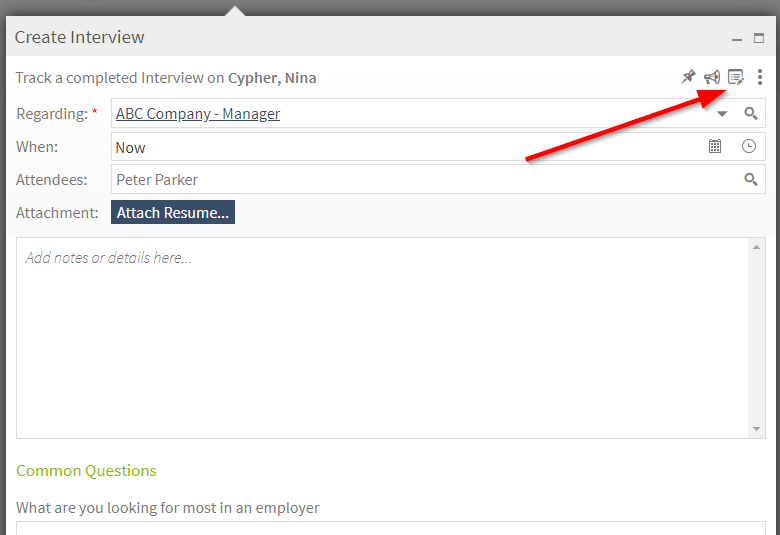 FIXED – Resumes in Search – We’ve fixed a bug preventing users from opening resumes directly from search results. FIXED – Table Borders in Email Templates – When sending emails using a template with a table, the borders were not showing in Microsoft Outlook. These should now be appearing. For existing templates, users will need open and re-save the template for this change to take effect. To learn more about our upcoming features, be sure to check out our 2018 roadmap. We sincerely hope you enjoy all the new capabilities of Crelate!